There are numerous well-entrenched large players providing core administration solutions for the healthcare industry. They provide software, hardware, and services. This makes the market not just fragmented but also highly competitive. The top notch players are seen eyeing the untapped markets in China, Brazil, and India which are relatively under tapped. To that end they are focusing on mergers and acquisitions of regional and local companies which would enable them to make easy inroads into their markets. 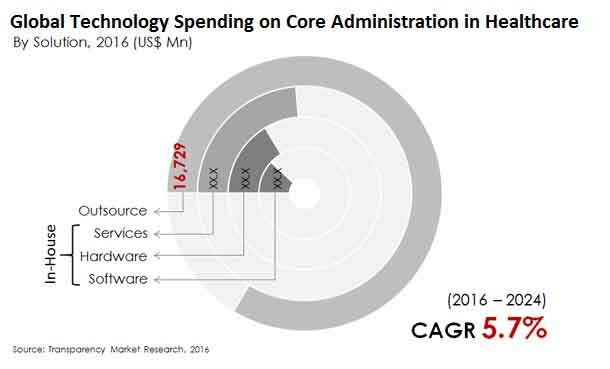 As per a report by Transparency Market Research, the worldwide technology spending on core administration in healthcare market will likely rise to US$42,317 mn by the end of 2024 from around US$25,900 mn in 2015 by registering a steady CAGR of 5.7%. Among some of the prominent end users of core administration solutions in the healthcare industry, the segment of payers held a lion’s share of 88.0% in the market in 2015. Going forward too, it is predicted to drive substantial spending in core administration in the healthcare industry. From a geographical standpoint, North America led the market with half the share in 2015. In the near term as well North America will lead the market because of the increasing scarcity of resources for patient-centric processes and inadequate number of skilled workforce for managing administrative processes. With cost competition at its zenith in the healthcare industry, insurance agencies, also called payers, are egging healthcare providers to opt for a value-based reimbursement module from a volume-based one. Despite having cost benefits, value-based reimbursement modules are fraught with financial risks for those providing them. This necessitates proper management of core administrative processes to reduce costs. This, in turn, needs a solid IT infrastructure and also an integrated platform wherein the payers can streamline workflows for provider contracting and engagement. Over the course of the next couple of years, the pressing requirement for such platforms is expected to fillip technology spending on core administration in the healthcare sector. Despite such a promising outlook, the spending on technology for core administration in the healthcare sector is predicted to be clipped by the usage of outdated technology and applications in various delivery and data collection nodes, continuously changing reforms in the healthcare domain, and changing methods of financial transactions. Besides, inadequately trained healthcare professionals unable to handle complicated and time-consuming features in sophisticated digital healthcare applications is also hampering such spending.